Time to pick up work on the Vintage Mac Network again - but a little different this time. I figured I'd make a series of article, writing about PowerBooks, compacts, and desktops in separate articles. 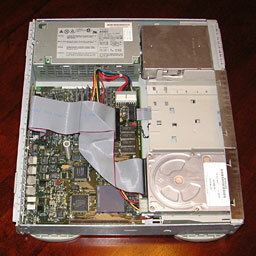 For now I'd like to talk about just one machine: The Quadra 610 server. This baby is maxed nearly to the max with a PowerPC 601 upgrade, ethernet, a CD-ROM drive, 26 MB RAM (68 MB is the max), and, finally, an LCD monitor. It primarily works as the server on my network, although I also use it for performing tasks just a bit too heavy for the 680x0 chips and, of course, web browsing. You might wonder, "Is it really worth the effort and money to upgrade such an old machine?" It fills many functions in my home: file server, print server, LocalTalk bridge, web browsing machine, writing machine . . . I could go on forever. Anyway, if you happen to find one of these machines, consider buying it. It's a lot of fun seeing it grow from an old 68040 machine to a full-fledged PowerPC server. Why use it as a server? Because it's silent. Because it's slim. Because this baby never gets above 95°F. Finally, it's easy to upgrade. That case slips off very easily, and - unlike ye olde Compaq Deskpro 133 - the case is roomy. Sadly, there's only one NuBus slot (an optional feature). Earlier I said, "Because it's slim." That's right. If you are running short on space, these are very nice servers. They use the "pizza box" case and fit almost everywhere. Remove the keyboard, mouse, and screen, and you've got yourself a headless server. 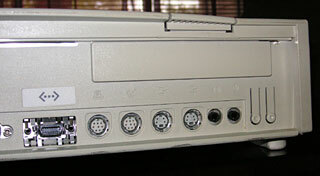 Ports: DB-15 video, SCSI, AAUI for ethernet, 2 Apple serial, and 2 ADB ports. Additionally, the port array on the back is big. Two ADB ports, which means one for keyboard and mouse and one for a joystick. (Very useful for vintage Mac gamers such as myself), and of course there's the standard DB15 video, SCSI port, printer port, and modem port - all packed into a slim, pretty little case. If you have plans on networking your old Macs, this machine will make the perfect server. Editor's note: The photos accompanying this column are of a Centris 610 here at Low End Mac headquarters. The two models are physically identical, although the Q610 runs 25% faster.